I just have to say that the trip you two put together was outstanding! Very smart planning. I had the time of my life — I loved it all — especially the people. Especially the city. Especially the shows. Especially the dancing, the food, the taxis, the bus rides, the hotel, the shopping, the shoes, the classes, the teachers, the dances, the tour, the streets, the subway, the wine, the chocolate, the jacuzzi, the weather, the, the, the . . I truly hope you and Pablo can do another trip during my spring break next year because I’ll be the first to sign up. I love you guys Thanks for being you! Fun and funny and thoughtful and beautiful. Kisses to the little actress. Thanks for great photos, but most of all thanks for a wonderful, well planned visit. Everything from start to finish, to in between was fantastic. Thanks for your dedication. A trip of a lifetime! The only problem… How do you ever match or top a trip like this! Each day we would ask can it get better? And it did. Pablo went beyond the call of duty. We all knew it and appreciated it. Alicia and Uma provided the extra guidence and fun on our daily walks and outings. A special thanks to the trip family for all the help and camaraderie given to this newbee. And ladies, I enjoyed every dance with you. To the people who will contemplate taking this trip in the future, don’t miss it. A special shoutout to my “friends to the end” who really made it worthwhile. We had only met Pablo and Alicia for a brief period when we were on vacation in the Naples area but we knew immediately that they were a caring couple and great teachers as well. When we received notice of their tango tour we were very excited and signed up immediately. We loved our experience(march 23-30, 2013). We went to milongas every night in different parts of Buenos Aires, visited the countryside, saw a fabulous Tango show(and we have seen a number of them), explored different parts of Buenos Aires(for shopping, eating and sights seeing) and had a great two hour dance lesson every day with excellent teachers including Pablo and Alicia. We had lots of fun with the other tour members who were all very interesting and compatible and shared lots of laughs. Most importantly, we had been worried about being in a strange country and not being able to speak spanish and getting around late at night after the milongas. Alicia and Pablo were with us every step of the way and if we needed to go back to the hotel early because we were tired and couldn’t take the bus they had hired for the group, they personally put us in a cab and instructed the cab driver where to take us. If we needed help ordering food, they were there, if we needed help navigating currency exchanges they helped us to understand how to do it and also how to avoid any unnecessary dangers that can occur in any large city. if you want to dance tango and explore the mystique of Argentina and Buenos Aires, we would highly recommend a tour with this wonderful couple. Thank you both so much for all the work that went into putting together such a thorough tour! Your patience and graciousness are beyond belief!! The lessons were exceptional – our favorite part – and the tours and milongas interesting and entertaining. We’ve certainly never had so much fun on so little sleep! I would like to thank you both for such a wonderful tango experience in Buenos Aires. You were such great hosts! I enjoyed the Milongas (Salon Canning my favorite) and lessons as well as touring the other areas of the city – can’t forget shoe shopping also! Thanks for sending the pictures. I’ll look forward for your next trip to Seattle. 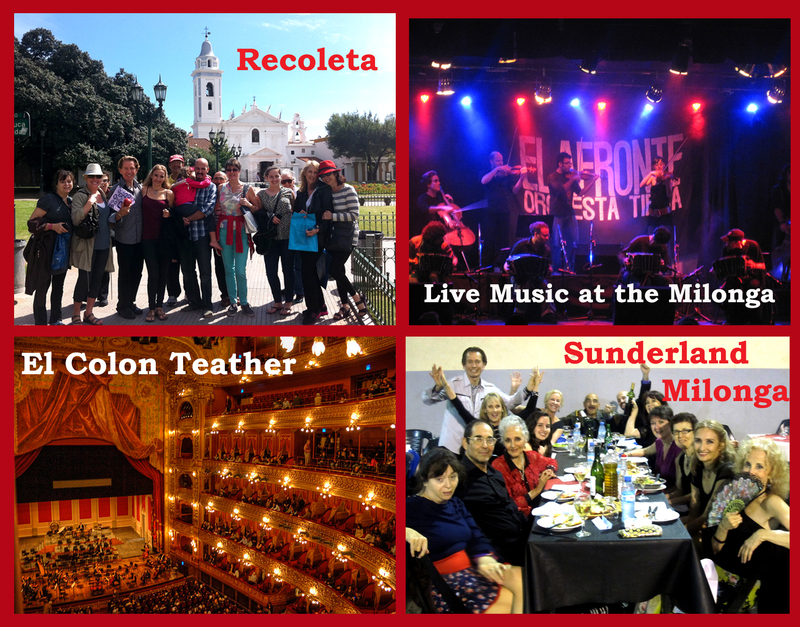 I’m sure all tango tours to Buenos Aires offer something special. But only Alicia and Pablo have Uma, their precocious daughter, who pretty much ran the show…much to the delight of the 12 or so in our group. Alicia thought ahead and bought tickets to Teatro Colón. We enjoyed Carmen in Spanish! Our table for the dinner/show at Cafe’ de los Angelitos was the best in the house. I bet Alicia had something to do with that also. It was a fantastic show. The tango boutique Hotel Mansion Dandi Royal was our starting point for a new class and then a milonga every night. We had a chance to mingle with the locals and try our luck with cabeceos. Folks in B/A eat well. I found myself enjoying Steak Lomo and Eggs at 10 in the morning. And more Malbec’s than than I could possible taste…try as I might. We were able to see some of the county side on the day trip to Estancia Don Silvano. They actually got me up on a horse. Patagonia ! The extra trip to El Calafate in Patagonia allowed me to check one off my bucket list…the Perito Moreno Glacier was magnificent. Trip of a life time? I’ve been on many but this was one of the best. Thanks Uma…and you too Alicia and Pablo. Thank you so much for making this trip possible. To say the least, Joyce and I had a wonderful time and learned so much!!!! I went with Pablo and Alicia on the 2012 trip and had an amazing time. The classes were great, we went on walking tours of the city, shopped for shoes, went to milongas every night, and more. The side trip to the glacier was great. I would love to go with them again! This trip was more than wonderful. Alicia was so watchful of us in the big city of Buenos Aires. Pablo was the perfect host and little Uma the icing on the cake. It was a shoe shopper’s delight, a dancer’s dream week and a feast for the eyes with all the sights. The side trip to the glacier was spectacular. I only can imagine what they have in store this year! Sinceramente deseo que ustedes Alicia y Pablo puedan hacer otro viaje durante mis vacaciones de primavera el ano que viene porque voy a ser la primera en anotarme. Los quiero mucho chicos, gracias por ser ustedes! Divertidos, graciosos, generosos y hermosos. Besitos a la pequena actriz. Muchisimas Gracias a los dos por todo el trabajo que pusieron en organizar este tour tan completo! La paciencia de ustedes y su amabilidad son increibles!! Las clases fueron exepcionales – nuestra parte favorita – y los tours y las milongas interesantes y divertidas. Nosotros nunca nos habiamos divertido tanto dormiendo tan poquito! Me gustaria agradecerles a los dos por esta experiencia de tango maravillosa en Buenos Aires. Ustedes fueron unos anfitriones espectaculares! Disfrute las milongas (Salon Canning mi favorito) y las clases como tambien los tours en otras areas de la ciudad – no me puedo olvidar de la compra de los zapatos tambien! Gracias por mandar las fotos. Espero verlos en su proximo viaje a Seattle. Muchisimas Gracias por hacer posible este viaje. Joyce y yo la pasamos espectacular y aprendimos un monton!!!! Gracias por una bienvenida a Bs As absolutamente maravillosa; ustedes nos planearon un menu perfecto de baile, paseos, y entretenimientos — cuidando todos los detalles y al mismo tiempo siendo tan amables con todo el mundo. Pablo y Alicia son unos bailarines elegantes y muy claros como instructores; y la pequeña Uma es irresistiblemente adorable y cuando necesite que me enseñaran el cabeceo ella me enseño “ojitos”!